The parish of Westacre is situated in the west of Norfolk. It lies north of Narford, west of Castle Acre, south of Great Massingham and east of Gayton and East Walton. The acre part of the name derives from the Old English meaning ‘plot of land’, with the west part being self-explanatory. The parish has a long history and was established by the time of the Norman Conquest. Its population, land ownership and productive resources were detailed in the Domesday Book of 1086. This document revealed that Ralph of Tonsy held land in the parish after 1066. The resources listed for West Acre include mills, salthouses and various livestock - notably sheep. It is worth noting that Westacre in particular has been subject to extensive fieldwalking and metal detecting surveys since the 1980s. As such, only a fraction of the small finds recovered can be mentioned here. The prehistoric period is very well represented amongst the archaeological records for Westacre. The earliest sites comprise flint pot boiler scatters (NHER 33665 and 33677), and these indicate that the inhabitants were heating water for cooking and domestic purposes. A variety of prehistoric stone objects have also been reported and these include knives (NHER 21302), flakes (NHER 33670) and a hammerstone (NHER 33676). A couple of tools have been dated to the Mesolithic period and these comprise flint axeheads (NHER 13342) and a blade (NHER 34471) – a particularly characteristic find from this era. A larger tool assemblage exists for the Neolithic period in Westacre. Along with the ubiquitous polished flint axeheads (e.g. NHER 3782 and 21302) other artefacts consist of laurel leaf points (NHER 32164), adzes/discoidal knives (NHER 14955), scrapers (NHER 33662) and pottery sherds (NHER 3953). The subsequent Bronze Age seems to have been busiest period of prehistory. A possible ring ditch (NHER 3953) and round barrow (NHER 3783) have been noted on aerial photographs of the parish. The first metal objects also appear at this point and metal detecting has recovered axeheads (NHER 3953), spearheads (NHER 31075), an ingot (NHER 21302), a button (NHER 32162), a tanged chisel (NHER 32619) and pieces of copper alloy casting waste (NHER 29720). At the beginning of the period flint tools continued to be used, and some of these have also been found (e.g. NHER 34473). Several sherds of Bronze Age pottery (NHER 3953) have also been unearthed in Westacre. A possible Iron Age settlement (NHER 37811) exists in Westacre. Magnetic anomalies indicative of Iron Age or Roman settlement remains were recorded during a field reconnaissance survey along the route of a gas pipeline. However, fieldwalking and metal detecting surveys in the area failed to recover any substantiating evidence. It is also worth noting that an Iron Age square barrow has postulated to lie to the southeast of the Priory remains (see NHER 47079 and 46917). The remainder of the Iron Age evidence comprises artefacts, with a number of coins (NHER 28744, 29920 and 31168), pottery sherds (NHER 3953 and 22630), a bridle bit (NHER 33660) and button (NHER 31881) on record. It has been suggested that a Roman settlement was reported in Westacre during 1931 (NHER 3875). However, the exact location of this settlement remains unknown. A Roman enclosure with associated pits (NHER 3879) has been noted. Various sherds of pottery and pieces of metalwork were found on site including a hoard of minim coins. Additionally, several possible Roman cremation urns have been recovered from the garden of the Vicarage (NHER 3955). A large number of Roman objects have been found at various locations dotted across the parish. The finest objects reported comprise a vessel escutcheon (NHER 29720), a pierced coin (NHER 31075), a trumpet brooch (NHER 31165) and a finger ring (NHER 29720). A collection of toilet implements has also been discovered, such as a nail cleaner (NHER 33688), hairpins (NHER 32619) and probe (NHER 31168). Other finds include a steelyard weight (NHER 33685), coin blank (NHER 33678), key (NHER 30821), bracelets (NHER 3876 and 32813), bead (NHER 33660) and assorted pottery sherds (NHER 31887, 32161 and 32165). Two Early Saxon cemeteries (NHER 3781 and 16841) have been noted in Westacre. The larger of these (NHER 3781) extends across two sites (NHER 19640) and was identified by the presence of urns, brooches and cremated human remains. The other cemetery (NHER 16841) had less obvious indicators of burials (i.e. no urns or bones) but had enough Early Saxon metalwork objects (like brooches, buckles, clasps, tweezers) to suggest the area may have been used as a cemetery. The only other Saxon site or monument reported in Westacre is a Late Saxon/early medieval stone bridge (NHER 32166) that apparently once existed where Gregs Dam (now Clarke's Drove or Chase) crosses Puny Drain. A rich diversity of Saxon metal artefacts have been discovered through metal detecting. 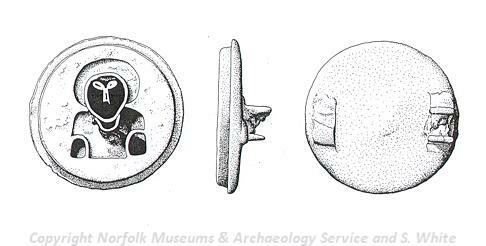 Early Saxon finds include a brooch converted into a belt mount (NHER 21302), tweezers (NHER 30820), a shield stud (NHER 33686) and a bronze annular bead (NHER 31168). Fewer Middle Saxon objects have been unearthed, but those that have consist of items like strap ends (NHER 28744) and tweezers (NHER 30821). As is often the case, many of the Saxon finds from the parish date to the latter part of the period. 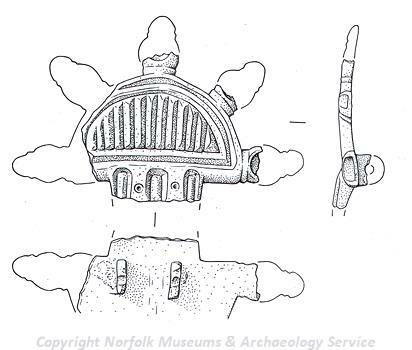 This corpus of finds comprises weights (NHER 29720), a knife (NHER 29920), a spindlewhorl (NHER 30820), ring (NHER 31881), hasp (NHER 32876) and earring (NHER 33686). During the medieval era Westacre seems to have been a place of some religious importance. The Augustinian Order built a medieval priory (NHER 3881) during the reign of Henry I (1100-1135). It was in use until around 1538 when it fell from use. The remains of the priory church, cloisters, chapter house, gatehouse, barn, and other buildings survive on site. In addition, extensive earthworks relating to this monastic compound can be observed. In addition, the Wooden House (or Wealden House) (NHER 16850) incorporates a plinth of reused stone from the Priory. However, the majority of this picturesque timber-framed and weatherboarded house dates to the 15/16th centuries. Several other post medieval cottages in the village (see NHER 18208 to 18213) also make use of pieces of medieval stonework, although it is uncertain whether these stones also come from the ruined Priory. 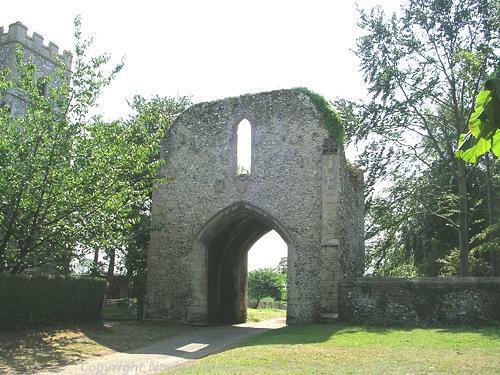 Although All Saints Church (NHER 3889) is not of medieval origin, there were two medieval chapels in Westacre. The first was dedicated to St Peter (NHER 3886 and 29201) and was believed to stand near to Chapel Dyke and The Stone. However, the exact location of this chapel is unclear and it may in fact lie about 600m to the west of Church Green (NHER 3886). A second chapel (NHER 4010), dedicated to St Thomas a Becket, stands on the site of Custhorpe deserted medieval village (see NHER 3983). The chapel operated as a cell of Westacre priory with two or three monks living on the northeast side of the chapel. Only flint footings now remain, but digging on the chapel site in 1980-81 recovered a large number of glazed tiles. The village of Custhorpe itself (NHER 3983) was mentioned in the Domesday Book but its exact location within Westacre parish is unknown. Another area of medieval activity has been identified to the north of the properties on Low Road (NHER 29470). Aerial photographs of this area show a number of earthwork features at this location. Some of these features could be a watercourse of some sort or possibly lazy beds or fishponds. Investigation of the site in 1995 recorded two toft-like enclosures, pits and a raised platform as well as evidence of lime quarrying in the central area. Various finds were also recovered, including Late Saxon and medieval pottery sherds along with medieval bricks. As such, it seems likely that buildings were present here in the medieval and post medieval period and that agricultural and industrial activities may have taken place on site. Agricultural features also show up on other aerial photographs of the parish. These include the earthworks of ridge and furrow (NHER 29824) and evidence of field systems that survive in the post medieval High House Park (NHER 31636). Earthworks of a possible medieval road (NHER 33672) have also been noted some 800m to the southwest of West Acre Vicarage (NHER 3955). Numerous medieval small finds have been found in Westacre. More interesting objects include a late medieval/early post medieval buckle of serpentine design (NHER 32876), a gold pendant (NHER 18880), a repousse rosette belt boss (NHER 29920) and part of a mirror (NHER 31075). Several religious artefacts have been recovered, perhaps unsurprising considering a Priory was in operation here, and these comprise a boy bishop token (NHER 32619), a Papal bulla (NHER 31875) and several lead ampullae (NHER 29720 and 31884). More mundane finds consist of an iron key (NHER 30125), purse frame (NHER 30707), various buckles (NHER 32162), weights (NHER 32766 and 33685) and part of a spur (NHER 33685). A number of post medieval industries are recorded for Westacre. The site of a watermill (which later became a flour medieval) has been reported. The mill itself has gone, but Mill House survives as an 18th century listed building (NHER 15002). A limeworks (NHER 16708) from this era has also been discovered. Two kilns from the works were reported but only fragmentary remains survive. Another brick built structure that survives is an icehouse (NHER 3888), which lies to the west of High House (NHER 3887). It is egg shaped and built from pinkish brick with a well-preserved omphalos drain in the centre at the bottom. The ice is said to have come from the pond by Hall Farm. In terms of buildings erected in this period there are a number of notable examples. Firstly, All Saints Church (NHER 3889) was built in 1638 by Sir Edward Barkham to commemorate his first election as Lord Mayor of London in 1621. He hoped to establish his credentials by using a debased Gothic style along with more up to date Classical features. It is an outstandingly important building, certainly unique in Norfolk, and contains an important collection of 19th century monuments, and 17th century woodwork. The second building that merits a mention is High House (NHER 3887) (more commonly known as Westacre Hall). This grand abode was built prior to 1756 on the side of an older mansion. It has a gault-brick façade, castellations and various Classical features. Inside, the principal room is the upstairs dining room. This magnificent room contains the head of medusa along with a Greek inscription. Aerial photographs of the mansion show the cropmarks of formal gardens and dewponds. As was the fashion, High House stands within its own park (NHER 31636). This late 18th century landscape park contains various earthworks visible on aerial photographs and on the ground. The park was doubled in size in the early 19th century. Those interested in architecture should also take a look at Home Farm (NHER 32149) and Abbey Farm House (NHER 47079). Home Farm retains a portion of timber framing and probably dates to the 16th/17th century, although it was refaced in the 18th century and heightened in around 1900. Abbey Farm House is slightly later in date, having been built during the 18th century, and is of interest due to the fact that it possibly incorporates an earlier core formed from the monastic remains of the Priory of St Mary and All Saints. Documentary and archaeological evidence also shows that a number of post medieval buildings (NHER 31880) existed to the north of Limekiln cottages (NHER 18211). Brief mention should be made of the post medieval artefacts that have been discovered in Westacre. Several fine items have been found including a gold finger ring (NHER 30125), a cuff link (NHER 31168) and sword guard (NHER 32619). Other objects comprise three silver coins that may be part of a hoard (NHER 31165), cloth seals (NHER 31881 and 33688), coin weights (NHER 31884), seals (NHER 21302), a hooked fastener (NHER 30820), a key (NHER 21302) and jettons (NHER 28744) and buttons (NHER 33685). The most recent archaeological record for Westacre concerns the site of some World War Two gun emplacements or radar beacons (NHER 33720). An aerial photograph taken in 1946 showed three circular structures to the east of Tumbleyhill Plantation. The western one had an entrance to the northeast and a small tower on its northern flank. The eastern one had an entrance to the west. Thomas Sunley (NLA) 21 September 2007.